Received July 23, 2018; Accepted December 12, 2018.; Published online January 2, 2019. OCT4, also known as POU5F1 (POU domain class 5 transcription factor 1), is a transcription factor that acts as a master regulator of pluripotency in embryonic stem cells and is one of the reprogramming factors required for generating induced pluripotent stem cells. 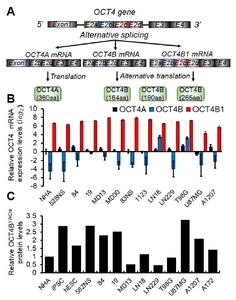 The human OCT4 encodes three isoforms, OCT4A, OCT4B, and OCT4B1, which are generated by alternative splicing. Currently, the functions and expression patterns of OCT4B remain largely unknown in malignancies, especially in human glioblastomas. Here, we demonstrated the function of OCT4B in human glioblastomas. Among the isoform of OCT4B, OCT4B-190 (OCT4B19kDa) was highly expressed in human glioblastoma stem cells and glioblastoma cells and was mainly detected in the cytoplasm rather than the nucleus. Overexpression of OCT4B19kDa promoted colony formation of glioblastoma cells when grown in soft agar culture conditions. Clinical data analysis revealed that patients with gliomas that expressed OCT4B at high levels had a poorer prognosis than patients with gliomas that expressed OCT4B at low levels. Thus, OCT4B19kDa may play a crucial role in regulating cancer cell survival and adaption in a rigid environment. Glioblastoma (GBM) is the most aggressive brain cancer, and exhibits distinct histological features such as necrotic regions as well as genetic alterations such as mutation in NF1, IDH1, TP53, and EGFR (Verhaak et al., 2010). Despite many efforts to develop effective treatment strategies, surgery followed by concurrent treatment of temozolomide (TMZ) and ionizing radiation (IR) is the only standard therapy currently available. The presence of the blood-brain barrier and heterogeneous cell populations in the tumor bulk are key obstacles against varying treatments (Eun et al., 2017; Lathia et al., 2015). However, these features do not fully account for the high frequency of recurrence and resistance against conventional therapies. Glioblastoma stem cells (GSCs) are a small population of glioblastoma cells that exhibit self-renewal capabilities, persistent proliferation, and tumor initiation (Lathia et al., 2015). GSCs have been reported to be responsible for the resistance to TMZ and IR therapies and consequent tumor recurrence as well as a poor prognosis in patients with GBM (Kim et al., 2015). OCT4, also known as POU5F1, is a transcription factor involved in stem cell pluripotency. The OCT4 gene is located on chromosome 6 and comprises of 7 exons (Takeda et al., 1992). This gene encodes three isoforms (OCT4A, OCT4B, and OCT4B1) as a result of alternative splicing (Wang and Dai, 2010). OCT4A translates into one protein (360 amino acids), whereas OCT4B and OCT4B1 can translate up to three proteins (265, 190, and 164 amino acids, respectively) through differential usage of translational initiation sites (Gao et al., 2010). Currently, many studies have demonstrated that aberrant expression of OCT4B has been detected in various human malignancies including gastric cancer (Asadi et al., 2011), colorectal cancer (Gazouli et al., 2012), bladder cancer (Asadzadeh et al., 2012), and cervical cancer (Li et al., 2015). OCT4B also renders cells resistant to apoptotic cell death and heat shock or genotoxic stresses (Gao et al., 2012; Wang et al., 2009). OCT4A and OCT4B are localized in different subcellular regions: OCT4A is localized to the nucleus and functions as a transcription factor, whereas OCT4B is mainly located in cytoplasm (Lee et al., 2006). Therefore, the precise expression pattern and biological functions of OCT4B isoforms remain largely unknown. In the present study, we delineate the expression pattern of the OCT4A and OCT4B isoforms in human glioblastoma cells and reveal a novel biological function of OCT4B, which is predominantly expressed in human glioblastoma cells. Human glioblastoma cell lines U87MG (p53 wt, PTEN mut, p14ARF/p16del), LN229 (p53 mut, PTEN wt, p14ARF/p16del), LN18 (p53 mut, PTEN wt, p14ARF/p16 del), T98G (p53 mut, PTEN mut, p14ARF/p16 del), A172 (p53 wt, PTEN del, p14ARF/p16del), and A1207 (p53 wt, p14ARF/p16del) were purchased from the American Type Culture Collection (ATCC, USA). Human glioblastoma cells and normal human astrocytes (NHAs) were cultured in high-glucose Dulbecco’s Modified Eagle’s medium (DMEM) supplemented with 10% fetal bovine serum (Serana, Australia), 1% penicillin/streptomycin (Lonza, Switzerland), and 2 mM L-glutamine (Lonza) at 37°C with 5% CO2 and 95% humidity. GSCs were kindly provided by Dr. Ichiro Nakano (Mao et al., 2013). GSCs were cultured in DMEM/F12 (Lonza) supplemented with B27 (0.04%; Invitrogen, USA), epidermal growth factor (EGF; 20 ng/mL; R&D Systems, USA), basic fibroblast growth factor (bFGF; 20 ng/mL; R&D systems), 1% penicillin/streptomycin (Lonza, Switzerland), and 2 mM L-glutamine (Lonza) at 37°C with 5% CO2 and 95% humidity. To assess the response to heat shock, LN229, U87MG and T98G glioblastoma cells were heat shock treated at 45°C for 3 and 6 h. To assess the response to genotoxic stress, LN229, U87MG and T98G glioblastoma cells were incubated with BCNU (70, 90 and 240 μg/ml; Sigma-Aldrich, USA) for 24 h. The target sequence of human OCT4 is 5′-GCCAGAAGGGCAAGCGATC-3′. OCT4 siRNA was purchased from Sigma-Aldrich, and the Screen-fect transfection reagent (Wako Puro Chemical, Japan) was used according to the manufacturer’s instructions. LN229, T98G and NHA cells were infected with lentivirus produced from the 293FT cell line (Life Technologies, USA) that was transfected with a lentiviral vector (pLL-CMV-puro, pLL-CMV-OCT4A-puro, pLL-CMV-OCT4B-puro, pLL-CMV-OCT4B1-puro, pLL-CMV-OCT4B19kDa-puro) and packaging vectors (3rd generation: pMDLg/pRRE, pRSV-Rev, and pMD2.G). The OCT4B19kDa construct was generated using site-direct mutagenesis kit (Invitrogen, USA) followed by manufacturer’s instructions. To assess proliferation, cells were infected with lentivirus and then 1.5 × 104 cells were plated into 6-well plates. The cells were harvested by trypsin digestion and stained with trypan blue to exclude dead cells. Then, live cells were counted using a hemocytometer on days 1, 3, and 5. LN229 glioblastoma cells infected with lentivirus containing genes for OCT4A, OCT4B, OCT4B1, and OCT4B19kDa were seeded in 24-well plates for 3 days. Then, cells were fixed in 4% PFA and incubated with primary anti-OCT3/4 (1:200; sc-8629, Santa Cruz Biotechnology, USA) antibody for 12 h at 4°C. Cells were washed twice with PBS and incubated with fluorescence-conjugated secondary antibody (Invitrogen) for 1 h at room temperature (19–21°C). Cells were then counterstained with the nuclear dye 4′,6-diamidino-2-phenylindole (DAPI; 1 μg/mL, Sigma-Aldrich) for 5 min. Fluorescence images were obtained using the Axio Imager M1 microscope (Zeiss, Germany). Tumor tissue sections that were obtained from patients with glioblastoma were incubated with an anti-OCT3/4 (1:200; sc-8629, Santa Cruz Biotechnology) antibody. The stained sections were then examined using optical and confocal microscopy (Zeiss). The qRT-PCR was performed to determine mRNA levels. Total RNA was isolated from cells using the TRIzol Reagent (Invitrogen) according to the manufacturer’s instructions. RNA (1 μg) that had been treated with RNase-free DNase was utilized as a template for synthesizing complementary DNA (cDNA) using the RevertAid First Strand cDNA Synthesis Kit (Thermo Scientific, USA) according to the manufacturer’s instructions. The qRT-PCR analysis was performed using the Takara Bio SYBR Premix Ex Taq and CFX096 (Bio-Rad, USA). The expression levels of each target gene were normalized to that of 18S rRNA. The primer sequences used are as followed: human 18S rRNA forward: 5′-CAGCCACCC GAGATTGAGCA-3′ and reverse: 5′-TAGTAGCGACGGGCGG TGTG-3′; human OCT4A forward: 5′-TCCTGGAGGGCCAGGAAT-3′ and reverse: 5′-TCAGGCTGAGAGGTCTCCAAG-3′; human OCT4B forward: 5′-GGGGAGATTGATAACTGGTGTG-3′ and reverse: 5′-GGCTGAATACCTTCCCAAATAGA-3′; human OCT4B1 forward: 5′-TCTGCAGATTCTGACCGCATC-3′ and reverse: 5′-TGGGGGAGGCCAGTCAAA-3′; human OCT4 (for total form) forward: 5′-AGTGAGAGGCAACCTGGAGA-3′ and reverse: 5′-ACACTCGGACCACATCCTTC-3′; human Cyclin D1 forward: 5′-AAGCTGTGCATCTACACCGA-3′ and reverse: 5′-CTTGAGCTTGTTCACAGGA-3′; human Hsp70 forward: 5′-AACCACCCCAAGCCAAGAAG-3′ and reverse: 5′-CATTCCGCTCCTTCTCCAGTT-3′; human Hsp72 forward: 5′-AGCGAGGCGGACAAGAAGAA-3′ and reverse: 5′-CTGA TGATGGGGTTACACACCT-3′; human Hsp90 forward: 5′-CCCTTCTATTTGTCCCACGA-3′ and reverse: 5′-CCGAGTCTAC CACCCCTCTA-3′; human Fibronectin forward: 5′-GGCCAGT CCTACAACCAGTA-3′ and reverse: 5′-CTCTCGGGAATCTTCT CTGTC-3′. Cell extracts were prepared using RIPA lysis buffer (150 mM sodium chloride, 1% NP-40, 0.1% SDS, 50 mM Tris, pH 7.4) containing 1 mM β-glycerophosphate, 2.5 mM sodium pyrophosphate, 1 mM sodium fluoride, 1 mM sodium orthovanadate, and protease inhibitor (Roche, Switzerland). The protein concentration was quantified using the Bradford assay reagent (Bio-Rad) according to the manufacturer’s instructions. Proteins were resolved by SDS-PAGE and then transferred to a polyvinylidene fluoride membrane (Pall Corporation, USA). Membranes were blocked with 5% non-fat milk and incubated with the following antibodies at the indicated dilutions: anti-OCT3/4 (1:330; sc-8629, Santa Cruz Biotechnology), anti-β-actin (1:10,000; A5316, Sigma-Aldrich). Membranes were then incubated with horseradish peroxidase-conjugated anti-IgG secondary antibody (Pierce Biotechnology, USA) and visualized using the SuperSignal West Pico Chemiluminescent Substrate (Pierce Biotechnology). Quantification of signal intensity of western blot analysis was performed using NIH ImageJ. 137Cs γ-ray irradiation at a dose rate of 2.04 Gy/min for a total dose of 20 Gy was conducted using an IBL 437C (CIS Bio-International, France). For cell cycle analysis, cells (2.5 × 106) were washed in ice-cold PBS, treated with trypsin, and fixed in cold 70% ethanol at 4°C for at least 24 h. Subsequently, they were washed twice in PBS and incubated in PI and RNase A for 3 h at 4°C. Incubated cells were analyzed by fluorescence-activated cell sorting (FACSVerse, BD Bioscience). To impose contact inhibition, 2 × 104 cells were cultured on a semi-solid medium. Triplicate samples were mixed 1:1 (v/v) with 0.5–1.2% agarose in cell growth medium for a final concentration of 0.25–0.6% agarose. The cell mixture was plated on a solidified layer of 1.0% agarose in growth medium. The number of colonies was counted after 30 days. Microarray datasets from the TCGA database of the National Cancer Institute (https://cancergenome.nih.gov) were classified into “OCT4-high” and “OCT4-low” according to the ± 2 folds higher or lower averages, respectively. The enrichment score was developed by single-sample GSEA (ssGSEA: http://software.broadinstitute.org/cancer/software/genepattern#). The OCT4A signature was derived as previously described (Ben-Porath et al., 2008). GSEA (https://www.broadinstitute.org/gsea/), a knowledge-based approach for interpreting genome-wide expression profiles, was performed as previously described (Subramanian et al., 2005). Statistical analysis was performed using the two-tailed Student’s t-test. Values of P < 0.05 (*), P < 0.01 (**) or P < 0.001 (***) were considered statistically significant for different experiments as indicated in the figure legends. Data are presented as means ± standard error of the mean (SEM). The OCT4 gene consists of 7 exons, and OCT4A, OCT4B, and OCT4B1 are generated by alternative splicing (Fig. 1A). Only OCT4A has exon 1, indicating that OCT4A has a different N-terminal region compared with OCT4B and OCT4B1. OCT4B and OCT4B1 have similar transcript structures except of exon 2c, but the function of exon 2c remains uncharacterized. The OCT4A gene encodes a single protein consisting of 360 amino acids, whereas the OCT4B and OCT4B1 genes enable the generation of three proteins consisting of 164, 190, and 265 amino acids via differential usage of translational start sites (Fig. 1A). First, we examined the expression of OCT4 isoforms in several human primary GSCs and glioblastoma cell lines. Quantitative RT-PCR analysis showed that OCT4B1 mRNA was abundantly expressed in human GSCs and glioblastoma cells (Fig. 1B). Western blot analysis revealed that OCT4A was predominantly upregulated in induced pluripotent stem cells (iPSCs) and embryonic stem cells (ESCs)(Supplementary Fig. S1A). Human GSCs and glioblastoma cells expressed only the 190-amino acid version of OCT4B (OCT4B19kDa) (Supplementary Fig. S1A; the 16-kDa protein is not shown in these data). OCT4B19kDa expression was markedly increased in human GSCs and glioblastoma cells compared to normal human astrocyte cells (NHA)(Fig. 1C). It is also noteworthy that OCT4B19kDa protein levels were markedly increased in glioblastoma cells compared to OCT4B1 mRNA levels. This may be attributed to a change in protein stability, possibly due to post-translational modification. Taken together, these results indicate that among the OCT4 isoforms, OCT4B19kDa may play an important function in human glioblastomas. To examine the biological function of OCT4 isoforms, we overexpressed OCT4A, OCT4B, OCT4B1, and OCT4B19kDa in LN229 glioblastoma cells that expressed low basal levels of endogenous OCT4B19kDa (Fig. 1C). First, to determine the biological function of OCT4B19kDa in human glioblastoma cells, we constructed an OCT4B-190 construct by site-directed mutagenesis that only expresses the 19-kDa protein of OCT4B (Fig. 2A). According to a previous study (Wang et al., 2009), the translational start codon in the 30- and 16-kDa protein fragments were changed to AGG and GTC, respectively. As shown in Fig. 2B, OCT4A only translated into one protein of 40 kDa, whereas OCT4B and OCT4B1 translated into proteins of 30, 19 and 16 kDa, respectively. We verified that the OCT4B19kDa construct translated only one protein of 19 kDa. Analysis via immunofluorescence revealed that OCT4A was localized to the nucleus, whereas OCT4B, OCT4B1, and OCT4B19kDa were localized to the cytoplasm and nucleus (Fig. 2C). Furthermore, OCT4B, OCT4B1, and OCT4B19kDa that localized to the nucleus were unable to function as a transcription factor because of the absence of a DNA-binding domain in their N-terminal regions. Immunohistochemical analysis showed that the OCT4 expressed in human glioblastoma specimens was mostly observed in the cytoplasm (Supplementary Fig. S1B). Therefore, it is plausible that the endogenous OCT4 isoform expressed in the human glioblastoma specimens is actually the OCT4B19kDa isoform, as judged by its expression in human glioblastoma stem cells and glioblastoma cells. A previous study has demonstrated that OCT4B regulates resistance to heat shock stress and genotoxic stress (Wang et al., 2009). We thus examined whether OCT4B19kDa may play a possible role in the stress response. We found that heat shock stress dramatically increased heat shock protein 72 mRNA and slightly elevated OCT4 mRNA in LN229 glioblastoma cells (Fig. 3A). However, there were no apparent changes in OCT4B and OCT4B1 mRNA levels (data not shown). Ectopic expression of each OCT4 isoforms including OCT4B19kDa in LN229 glioblastoma cells did not confer resistance to 1,3-bis(2-chloroethyl)-1-nitrosourea (BCNU), an alkylating agent (Fig. 3B). In addition, there were no significant differences in cell viability when LN229 cells expressing each OCT4 isoforms were treated with IR (Fig. 3C). Additional cell lines (NHA and T98G) were used to confirm that OCT4B19kDa do not render resistant to various stresses (Supplementary Fig. S2A). There was no change in OCT4 mRNA levels in the T98G cell line under heat shock stress (Supplementary Fig. S2B), and OCT4B19kDa did not increase cell viability under IR stress (Supplementary Fig. S2C). Since the T98G cell line is resistant to BCNU, we were unable to evaluate cellular resistance to genotoxic stress (Supplementary Fig. S2D). To confirm the function of OCT4B19kDa, we treated U87MG cells with siRNA to reduce OCT4B expression (Supplementary Fig. S3A). 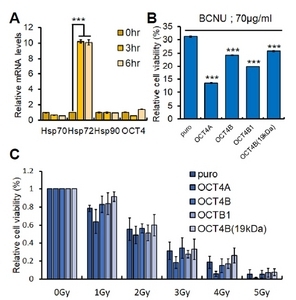 Consequently, knockdown of OCT4B did not confer resistance to BCNU (Supplementary Fig. S3B). Under heat shock stress, the mRNA expression of HSP72 was significantly increased, and gene silencing of OCT4B was not associated with cell viability (Supplementary Figs. S3C and S3D). Taken together, these results indicate that, in contrast to other tumors published in previous studies, OCT4 isoforms did not render glioblastoma cells resistant to heat shock and genotoxic stresses. Since OCT4B19kDa function is not associated with various cellular stresses in glioblastoma cells, we investigated other stresses that may be influenced by the tumor microenvironment. Tumor cells located in the marginal regions of the tumor can experience various stresses, since they are exposed to rigid environments or mechanical tensions arising from the extracellular matrix (ECM) or stromal cells of the surrounding environment (Butcher et al., 2009). To investigate the rate of cell growth in a rigid environment, we used a soft agar culture. In these culture conditions, there was a significant increase in the number of colonies of LN229 cells expressing OCT4B19kDa when compared to control LN229 cells (Fig. 4A). Of interest, the growth rate of LN229 cells expressing OCT4B19kDa did not differ from the control LN229 cells (Fig. 4B). We also found that there were no differences in the expression of Cyclin D1, a surrogate marker for cell growth, between LN229 cells expressing OCT4B19kDa and control LN229 cells (Fig. 4C). Cell cycle analysis also showed that OCT4B19kDa did not change cell proliferation (Supplementary Fig. S2E). Ectopic expression of OCT4B19kDa in both NHA and T98G cells showed increased number of colonies in soft agar culture (Supplementary Fig. S4A). In addition, there were no changes in the cell cycle due to OCT4B in both cell lines (Supplementary Fig. S4B). Further, we conducted an OCT4B knockdown experiment to determine the role of OCT4B19kDa in a rigid environment. Interestingly, the number of colonies was dramatically reduced by OCT4B knockdown in U87MG cells (Supplementary Fig. S5A). Cell cycle analysis suggested that the decreased colony numbers of OCT4B-knockdown cells were independent of the cell growth rate (Supplementary Fig. S5B). Among ECMs, fibronectin is known to induce cell proliferation and cellular stress resistance (Michael et al., 2014; SW et al., 2006; Yu et al., 2018). We found that fibronectin was significantly upregulated in LN229 cells expressing OCT4B19kDa (Fig. 4D). Although we did not observe integrin signaling activity such as focal adhesion kinase (FAK) activation in cells grown in the soft agar culture conditions (data not shown), fibronectin may participate cell growth through resistance to mechanical tension rather than activation of integrin and FAK signaling (Vogel et al., 2018). Our result suggests that the increases in colony growth in the soft agar cultures are attributable to endure a strong rigid environment. Therefore, it is plausible that OCT4B19kDa plays a crucial role for glioblastoma cell growth in rigid environments or during mechanical tension. Since the expression of OCT4 was detected in The Cancer Genome Atlas (TCGA) dataset by using a probe that corresponds to the common region of all OCT4 isoforms, we tried to distinguish the expression pattern between OCT4A and OCT4B in the TCGA dataset to understand the clinical relevance of OCT4B in human gliomas. We first divided patients with glioma into OCT4-high and OCT4-low groups, which have gliomas expressing OCT4 on average that were 2-fold higher and lower, respectively. We then performed a single sample gene set enrichment analysis (ssGSEA) to determine whether the OCT4A gene signature (genes transcriptionally regulated by OCT4A) is enriched in the OCT4-high group. The result showed that the OCT4A gene signature was not significantly enriched in the OCT4-high and OCT4-low groups (NES = −0.77)(Fig. 5A). 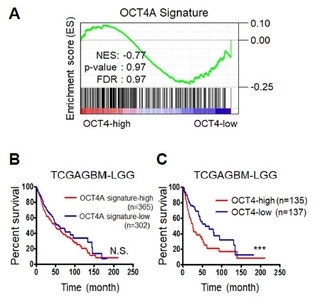 We also found that there were no significant differences in the survival of patients with glioma with an OCT4A gene signature-high (n = 365) and OCT4A gene signature-low (n = 302)(Fig. 5B). These results indicate that OCT4A may not be the main OCT4 isoform expressed in patients with glioma. However, patients with gliomas in the OCT4-high group showed significantly worse prognosis for survival than patients with gliomas in the OCT4-low group (p = 0.0003; Fig. 5C), implying that OCT4 isoforms expressed the gliomas may be OCT4B or OCT4B1, but not OCT4A. During the last decade, many studies have focused on understanding the biological function of OCT4A since it has been shown to regulate ESC properties (Radzisheuskaya and Silva, 2014). OCT4A is one of the Yamanaka factors capable of generating iPSCs by converting differentiated somatic cells into pluripotent cells (Takahashi and Yamanaka, 2006). However, aberrant expression of OCT4A promotes the formation of teratomas, which are characteristic tumors of stem cells and iPSCs (Abiko et al., 2010). In fact, recent studies have demonstrated that OCT4A was highly expressed in various types of solid tumors and may contribute to the generation of stem-like cancer cells, also known as cancer stem cells, which have self-renewal abilities and drug resistance (Du et al., 2009; Koo et al., 2015; Kumar et al., 2012). A number of studies have also demonstrated that OCT4 variants, known as OCT4B and OCT4B1, were detected in ESCs and several tumors (Atlasi et al., 2008; Rijlaarsdam et al., 2011). Thus, it is important to understand the precise roles of OCT4A, OCT4B, and OCT4B1 in stem cells and cancer biology. Although these proteins have similar structures within the POU domain and C-terminal domain, only OCT4A functions as a transcription factor because its N-terminal domain has DNA-binding capabilities. It is plausible that OCT4B and OCT4B1 may play different roles in stem cells and cancer cells. Several studies have reported that OCT4B is responsible for regulating cellular stresses, such as heat shock and genotoxic stress (Wang et al., 2009). The effect of OCT4B on heat shock and genotoxic stress might rely on the cancer cell type because in the present study OCT4B in the glioblastoma cells did not show any apparent responses to cellular stresses, such as heat shock and cytotoxic stress. OCT4B19kDa, one of the isoforms translated from OCT4B or OCT4B1, is expressed in GSCs and glioblastoma cells and is localizes to the cytoplasm of glioblastoma cells and tumors. OCT4B19kDa was not involved in cell invasion or the expression of genes related to epithelial-to-mesenchymal transition (data not shown)(Bronsert et al., 2014). It is plausible that OCT4B19kDa may promote ECM remodeling to support the rapid growth of glioblastoma cells outside of the tumor core region. However, we did not observe any significant changes in the expression of lysyl oxidase, a master regulator of ECM remodeling (data not shown)(Bonnans et al., 2014; Mammoto et al., 2013). We also performed a soft agar culture assay to mimic the in vivo mechanical tensions arising from a rigid environment. As a result, OCT4B19kDa promotes colony formation by rendering glioblastoma cells resistant to contact inhibition. Therefore, it is likely that OCT4B19kDa in the marginal region of tumors may allow glioblastoma cells to endure mechanical stress derived from the surrounding ECM or stromal cells. Fig. 1. (A) A schematic diagram showing mRNAs and proteins expressed from the human OCT4 gene. (B) A qRT-PCR analysis showing mRNA expression levels of human OCT4 isoforms including OCT4A, OCT4B, and OCT4B1 in normal human astrocytes (NHA), glioblastoma stem cells (528NS, 84NS, 19, and MD13) and glioblastoma cells (LN18, LN229, T98G, U87MG, A1207, and A172). (C) Relative OCT4B19kDa protein expression levels in different cell types described in (b). The signal intensity of western blot bands was quantified using NIH ImageJ. Fig. 2. (A) Mutagenesis scheme of OCT4B gene for expression of OCT4B-190 (designated as OCT4B19kDa). (B) Western blot analysis showing OCT4 overexpression in LN229 glioblastoma cells after being transduced with three lentiviral vectors containing genes for either OCT4A, OCT4B, OCT4B1, or OCT4B19kDa. (C) Immunofluorescent analysis showing subcellular localization of three OCT4 isoforms in LN229 glioblastoma cells. OCT4 isoforms were labeled with red fluorescence and the nucleus was counterstained with DAPI (blue). The arrowhead indicates OCT4A in the nucleus (red) and OCT4B, OCT4B1, and OCT4B19kDa in the cytoplasm (red). Scale bar, 50 μm. Fig. 3. (A) A qRT-PCR analysis showing mRNA expression levels of heat shock protein (HSP ) family and OCT4 in LN229 glioblastoma cells cultured at 45°C for 3 and 6 h. ***P < 0.001 (n = 3). Data are expressed as means ± SEM. (B) Cell viability of LN229 glioblastoma cells overexpressing each OCT4 isoforms treated with BCNU. ***P < 0.001 (n = 3). Data are expressed as means ± SEM. (C) Cell viability of LN229 glioblastoma cells overexpressing each OCT4 isoforms treated with 1, 2, 3, 4, and 5 gray (Gy) of ionizing radiation. Fig. 4. (A) Representative images showing colonies derived from LN229-puro and LN229-OCT4B19kDa cells grown in soft agar cultures (upper photos). Colony numbers of LN229-puro and LN229-OCT4B19kDa cells grown in different concentration of top agar were quantitated by counting (lower graph). **P < 0.01, ***P < 0.001 (n = 3). Data are expressed as means ± SEM. Scale bar, 5 μm. (B) Cell growth rate of LN229 glioblastoma cells overexpressing OCT4B19kDa. (C) A qRT-PCR analysis showing cyclin D1 mRNA expression levels in the LN229 glioblastoma cells overexpressing OCT4B19kDa. (D) A qRT-PCR analysis showing fibronectin mRNA expression levels in the LN229 glioblastoma cells overexpressing OCT4B19kDa. Fig. 5. (A) A ssGSEA analysis revealed that the OCT4A gene signature does not correlate with OCT4-high. The normalized enrichment scores (NESs) and p-values are shown in the plot. (B) Kaplan-Meier survival curve of patients with glioma with an OCT4A gene signature-high (n = 365) and OCT4A gene signature-low (n = 302). N.S. indicates no statistical significance. (C) Kaplan-Meier survival curve of patients with glioma with OCT4-high (n = 135) and OCT4-low (n = 137). ***P < 0.001. Abiko, K., Mandai, M., Hamanishi, J., Matsumura, N., Baba, T., Horiuchi, A., Mikami, Y., Yoshioka, S., Wakasa, T., and Shiozawa, T. (2010). Oct4 expression in immature teratoma of the ovary: relevance to histologic grade and degree of differentiation. Am J Surg Pathol. 34, 1842-1848. Asadi, M.H., Mowla, S.J., Fathi, F., Aleyasin, A., Asadzadeh, J., and Atlasi, Y. (2011). OCT4B1, a novel spliced variant of OCT4, is highly expressed in gastric cancer and acts as an antiapoptotic factor. Int J Cancer. 128, 2645-2652. Asadzadeh, J., Asadi, M.H., Shakhssalim, N., Rafiee, M.R., Kalhor, H.R., Tavallaei, M., and Mowla, S.J. (2012). A plausible anti-apoptotic role of up-regulated OCT4B1 in bladder tumors. Urol J. 9, 574-580. Atlasi, Y., Mowla, S.J., Ziaee, S.A., Gokhale, P.J., and Andrews, P.W. (2008). OCT4 spliced variants are differentially expressed in human pluripotent and nonpluripotent cells. Stem Cells. 26, 3068-3074. Ben-Porath, I., Thomson, M.W., Carey, V.J., Ge, R., Bell, G.W., Regev, A., and Weinberg, R.A. (2008). An embryonic stem cell-like gene expression signature in poorly differentiated aggressive human tumors. Nat Genet. 40, 499-507. Bonnans, C., Chou, J., and Werb, Z. (2014). Remodelling the extracellular matrix in development and disease. Nat Rev Mol Cell Biol. 15, 786-801. Bronsert, P., Enderle-Ammour, K., Bader, M., Timme, S., Kuehs, M., Csanadi, A., Kayser, G., Kohler, I., Bausch, D., and Hoeppner, J. (2014). Cancer cell invasion and EMT marker expression: a three-dimensional study of the human cancer-host interface. J Pathol. 234, 410-422. Butcher, D.T., Alliston, T., and Weaver, V.M. (2009). A tense situation: forcing tumour progression. Nat Rev Cancer. 9, 108-122. Du, Z., Jia, D., Liu, S., Wang, F., Li, G., Zhang, Y., Cao, X., Ling, E.A., and Hao, A. (2009). Oct4 is expressed in human gliomas and promotes colony formation in glioma cells. Glia. 57, 724-733. Eun, K., Ham, S.W., and Kim, H. (2017). Cancer stem cell heterogeneity: origin and new perspectives on CSC targeting. BMB Rep. 50, 117-125. Gao, Y., Wang, X., Han, J., Xiao, Z., Chen, B., Su, G., and Dai, J. (2010). The novel OCT4 spliced variant OCT4B1 can generate three protein isoforms by alternative splicing into OCT4B. J Genet Genomics. 37, 461-465. Gao, Y., Wei, J., Han, J., Wang, X., Su, G., Zhao, Y., Chen, B., Xiao, Z., Cao, J., and Dai, J. (2012). The novel function of OCT4B isoform-265 in genotoxic stress. Stem Cells. 30, 665-672. Gazouli, M., Roubelakis, M.G., Theodoropoulos, G.E., Papailiou, J., Vaiopoulou, A., Pappa, K.I., Nikiteas, N., and Anagnou, N.P. (2012). OCT4 spliced variant OCT4B1 is expressed in human colorectal cancer. Mol Carcinog. 51, 165-173. Han, S.W., and Roman, J. (2006). Fibronectin induces cell proliferation and inhibits apoptosis in human bronchial epithelial cells: pro-oncogenic effects mediated by PI3-kinase and NF-kappa B. Oncogene. 25, 4341-4349. Kim, J.K., Jeon, H.Y., and Kim, H. (2015). The molecular mechanisms underlying the therapeutic resistance of cancer stem cells. Arch Pharm Res. 38, 389-401. Koo, B.S., Lee, S.H., Kim, J.M., Huang, S., Kim, S.H., Rho, Y.S., Bae, W.J., Kang, H.J., Kim, Y.S., and Moon, J.H. (2015). Oct4 is a critical regulator of stemness in head and neck squamous carcinoma cells. Oncogene. 34, 2317-2324. Kumar, S.M., Liu, S., Lu, H., Zhang, H., Zhang, P.J., Gimotty, P.A., Guerra, M., Guo, W., and Xu, X. (2012). Acquired cancer stem cell phenotypes through Oct4-mediated dedifferentiation. Oncogene. 31, 4898-4911. Lathia, J.D., Mack, S.C., Mulkearns-Hubert, E.E., Valentim, C.L., and Rich, J.N. (2015). Cancer stem cells in glioblastoma. Genes Dev. 29, 1203-1217. Lee, J., Kim, H.K., Rho, J.Y., Han, Y.M., and Kim, J. (2006). The human OCT-4 isoforms differ in their ability to confer self-renewal. J Biol Chem. 281, 33554-33565. Li, S.W., Wu, X.L., Dong, C.L., Xie, X.Y., Wu, J.F., and Zhang, X. (2015). The differential expression of OCT4 isoforms in cervical carcinoma. PLoS One. 10, e0118033. Mammoto, T., Jiang, E., Jiang, A., and Mammoto, A. (2013). Extracellular matrix structure and tissue stiffness control postnatal lung development through the lipoprotein receptor-related protein 5/Tie2 signaling system. Am J Respir Cell Mol Biol. 49, 1009-1018. Mao, P., Joshi, K., Li, J., Kim, S.H., Li, P., Santana-Santos, L., Luthra, S., Chandran, U.R., Benos, P.V., and Smith, L. (2013). Mesenchymal glioma stem cells are maintained by activated glycolytic metabolism involving aldehyde dehydrogenase 1A3. Proc Natl Acad Sci USA. 110, 8644-8649. Pickup, M.W., Mouw, J.K., and Weaver, V.M. (2014). The extracellular matrix modulates the hallmarks of cancer. EMBO Rep. 15, 1243-1253. Radzisheuskaya, A., and Silva, J.C. (2014). Do all roads lead to Oct4? the emerging concepts of induced pluripotency. Trends Cell Biol. 24, 275-284. Rijlaarsdam, M.A., van Herk, H.A., Gillis, A.J., Stoop, H., Jenster, G., Martens, J., van Leenders, G.J., Dinjens, W., Hoogland, A.M., and Timmermans, M. (2011). Specific detection of OCT3/4 isoform A/B/B1 expression in solid (germ cell) tumours and cell lines: confirmation of OCT3/4 specificity for germ cell tumours. Br J Cancer. 105, 854-863. Subramanian, A., Tamayo, P., Mootha, V.K., Mukherjee, S., Ebert, B.L., Gillette, M.A., Paulovich, A., Pomeroy, S.L., Golub, T.R., and Lander, E.S. (2005). Gene set enrichment analysis: a knowledge-based approach for interpreting genome-wide expression profiles. Proc Natl Acad Sci USA. 102, 15545-15550. Takahashi, K., and Yamanaka, S. (2006). Induction of pluripotent stem cells from mouse embryonic and adult fibroblast cultures by defined factors. Cell. 126, 663-676. Takeda, J., Seino, S., and Bell, G.I. (1992). Human Oct3 gene family: cDNA sequences, alternative splicing, gene organization, chromosomal location, and expression at low levels in adult tissues. Nucleic Acids Res. 20, 4613-4620. Verhaak, R.G., Hoadley, K.A., Purdom, E., Wang, V., Qi, Y., Wilkerson, M.D., Miller, C.R., Ding, L., Golub, T., and Mesirov, J.P. (2010). Integrated genomic analysis identifies clinically relevant subtypes of glioblastoma characterized by abnormalities in PDGFRA, IDH1, EGFR, and NF1. Cancer Cell. 17, 98-110. Vogel, V. (2018). Unraveling the mechanobiology of extracellular matrix. Annu Rev Physiol. 80, 353-387. Wang, X., and Dai, J. (2010). Concise review: isoforms of OCT4 contribute to the confusing diversity in stem cell biology. Stem Cells. 28, 885-893. Wang, X., Zhao, Y., Xiao, Z., Chen, B., Wei, Z., Wang, B., Zhang, J., Han, J., Gao, Y., and Li, L. (2009). Alternative translation of OCT4 by an internal ribosome entry site and its novel function in stress response. Stem Cells. 27, 1265-1275. Yu, Q., Xue, Y., Liu, J., Xi, Z., Li, Z., and Liu, Y. (2018). Fibronectin promotes the malignancy of glioma stem-like cells via modulation of cell adhesion, differentiation, proliferation and chemoresistance. Front Mol Neurosci. 11, 130.